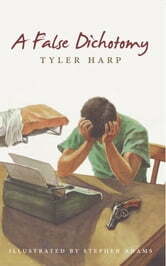 Tyler Harp is a forensic lab technician with a Bachelor's Degree in Software Engineering. He went to a prodigious college that gives Bachelor degrees in only two years; only twenty years old, he is allowed a gun, and is already at full work with people much older than him. One day, he is faced with an altercation with a known thug. After stabbing him, Tyler runs home. The next day, he finds himself charged with murder. Without much evidence, he is only suspended, not arrested. From there, he conducts his own investigation that travels to the very core of his psyche.